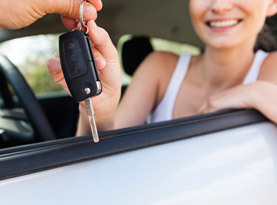 Searching for cheap car rentals at Santa Barbara Municipal Airport, California? Compare rates from multiple car hire firms with pick up available at all major airports. Begin by designating Santa Barbara Municipal Airport as your preferred starting location, indicating your pick up and drop off times. After selecting your vehicle type and entering the age of the primary driver, you will receive a quote allowing you to compare prices and complete your online booking. Although the city is served by public buses and trolleys, the only practical way to visit Santa Barbara's countryside or visit neighbouring cities is with a hire car. Santa Barbara Municipal Airport is a regional facility that connects to Los Angeles, San Jose and other cities in California. Most of the city's rental cars are hired on airport grounds. For affordable car hire at Santa Barbara Municipal Airport it is wise to book early, using internet-based tools to find the best rates. Once you have picked up your rental car at Santa Barbara Municipal Airport you can set out to explore the city's Spanish Colonial heritage. The most appealing building in town is the 18th-century Presidio, a former military stronghold open for tours. After picking up your hire car at Santa Barbara Municipal Airport you can cruise the quaint avenues of the historic quarter, stopping off at shops or a cafe along the way. A rental car is also the best way to reach Casa Del Herrero, a historic estate not far from the city. Temperatures at Santa Barbara Municipal Airport are highest during July and August. Fog rolls in during the summer and cuts down visibility, while winters are characterised by crisp, clear air and pleasant conditions.